In previous months, regional media had raised fears that Syria could end up being fragmented – or Balkanized – along ethnic lines. But Brahimi on Sunday said that prolonged fighting in Syria would leave the country lawless and ruled by armed militia and ‘warlords’. Inspired by Arab uprisings elsewhere, Syrians engaged in peaceful protests in March 2011, calling on the government of President Bashar Assad to enact reforms and begin democratization. However, this quickly turned into an armed rebellion following a government crackdown on protesters in some Syrian cities. The UN estimates that at least 40,000 people have been killed in the escalating conflict, which has drawn various armed groups such as Al-Qaeda in Mesopotamia to engage against government forces. Analysts have also warned of a widening Shia-Sunni conflict as some armed factions appear to be involved in sectarian warfare. “Syria will turn into hell” unless both sides come to the negotiating table, Brahimi said. He warned that by the end of 2013 the death toll could rise to 100,000. US Senators Joe Lieberman, John McCain, Lindsey O. Graham, agree with the special envoy’s assessment. They called on the Obama Administration to directly supply weapons to “vetted rebel groups” and establish a no-fly zone over parts of Syria. Russian Foreign Minister Sergei Lavrov sees such measures as adding to the bloodshed and not leading to a peaceful resolution of the conflict. In talks with Brahimi over the weekend, Lavrov stressed that the newly formed Syrian Opposition Coalition should see negotiations with Assad’s government as the only way out of the deteriorating situation. “When the National Coalition was formed we drew attention to the fact that it was stated in their platform that their position is uncompromising, their goal is the overthrow of the regime,” Lavrov told Russian media. 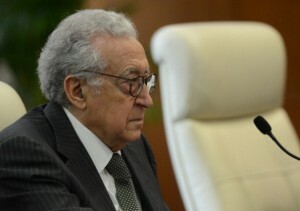 Lavrov and Brahimi agreed that the June 30 Geneva communiqué reached by the Syria Action Group – comprising US Secretary of State Hillary Clinton, former Arab League envoy Kofi Annan and Lavrov – remains the best solution to the conflict. However, Lavrov admitted that there was nothing his government could do to persuade Assad to resign his presidency and leave, a precondition to talks set by rebel groups.